Our Christmas Wreath With Sheep Ornament measures 2 3/8 inches in diameter. 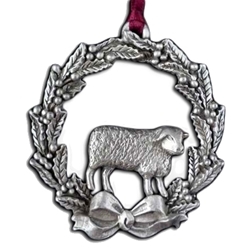 This Christmas Wreath With Sheep Ornament comes with a red satin ribbon ready to hang on your tree. Our detailed Christmas Wreath With Sheep Ornament combines the beauty of a holly wreath with an Elk prominently centered in the ornament. This is a great Christmas gift for anyone who likes sheep. This is a memories of the Christmas past. This ornament will always brings a smile to any face. It is cast in lead free pewter in the U.S.